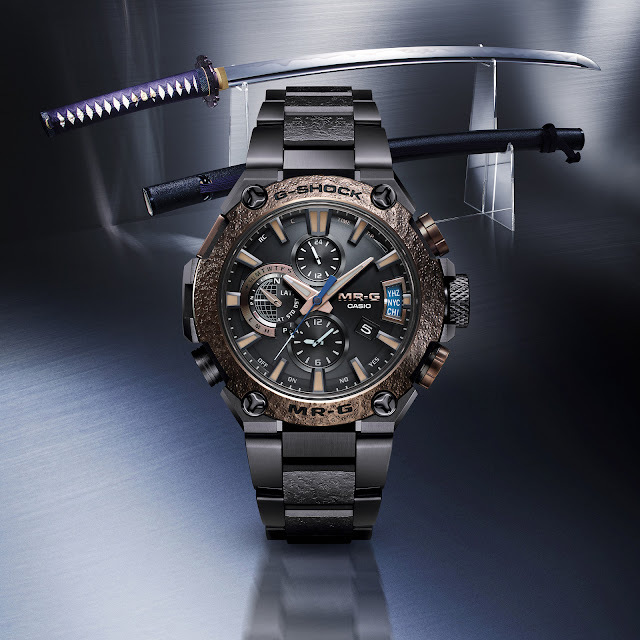 Today, Casio G-SHOCK announces the on-sale date of the special edition men's connected MR-G model, the MRGG2000HA-1. First unveiled earlier this year at Baselworld, each handcrafted one-of-a-kind MR-G will retail for $7,400 beginning in July 2018, with just 350 pieces available worldwide. The latest collaboration with third generation master craftsman Biho Asano was inspired by the unique texture found on the hilt guard or "Tetsu-Tsuba" of traditional Japanese swords. To achieve this one-of-a-kind look to the watch, Asano individually hammered each bezel, resulting in an artistic titanium sword guard finish on every watch known as "Arashi-Tuchime." Additionally, the colors featured on both the bezel and band boast regal shades of copper and deep violet found on the handle of Japanese swords. The deep colors are achieved through the new application of AIP® (Arc Ion Plating), a hardened coating to which a deep-layer hardening is applied for high abrasion-resistance. The MRGG2000HA-1A timepiece also includes premium features such as three-way time sync, made possible via Bluetooth Connectivity and the G-SHOCK app, as well as G-SHOCK's GPS Hybrid Wave Ceptor technology, which accurately measures time and location from anywhere on earth. The MRG2000HA-1A also features a sapphire crystal, titanium case and band with a special deep-layer hardening treatment – rendering it five times harder than regular titanium, and tough solar technology for self-charging capabilities – all in a 49.8mm case. The MRGG2000HA-1A will retail for $7,400 beginning in July 2018 and will be available for purchase at select jewelers, and the G-SHOCK Soho Store.